Time Saver - Holiday Cards Done Quickly and Easily! Since I could not send you all each a Christmas card I thought I would post them for you to see. And tell you my time saving hacks to make sending holiday cards or new year cards easier! Plus a 30% off discount code and free shipping to get yours now! Have you heard about Minted? This is the company I use to send all my cards and invitations to any event. I use them all the time. They did my wedding invitations, my birthday invitations and my Christmas/New Year cards just in the last 2 years. Minted has amazing patterns for any occasion that you can choose from done by various artists so the cards are really unique. Even better, the designs can each be customized to fit your occasion, theme and pictures. You can edit the borders, the backs, the language - everything to fit your needs. You can print on both sides as well - so you can do a picture on the front and do more details on the back about all that has happened this past year. Plus - THE BEST TIME SAVER - my favorite thing about Minted is that they do pre-printed address labeling - for free! It saves so much time, writing. I loaded up my mailing addresses easily and now I never worry where an address is! Plus as you can see from my envelopes the addressing is really ornate. I chose Christmas theme for my holiday cards to make them look more festive. Minted can also do return address labeling pre-printed on all your cards so no need to add labels for return addresses. They even have holiday stamps that can match your theme so you can avoid a trip to the post office! The turn around time varies but it can be really fast if you waive proofing/review of the images. Even if you proof it they usually turn it around in less than 24 hours which I think is pretty impressive. ​So maybe you did not send out your holiday cards yet or maybe you like to send your well wishes in the New Year. If so, you still have time to order your holiday cards plus 30% off your holiday card order now! The other reason I love Minted is that they also have customized gifts. So after you order your holiday cards, check out their gift section. They can do photo collages (already framed), prints, and so much more. This print in the picture below came framed from Minted and we used it as our "guest book" at our wedding. We loved having this personalized keepsake. Minted gifts could also be fun for a birthday gift for friends or family too. I gave another framed collage to my mom for her birthday with pics through the ages. She loved it! 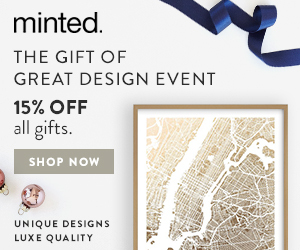 Plus we have a discount code for Minted gifts too! So what are you waiting for? Discount holiday cards and discounted, personalized gifts! YES! ​Here's to a very happy holiday season to you and yours!